The heavy northeaster didn’t fill in overnight as predicted. This is another beach day, but the various weather sources are still forecasting southwest wind (against the current) in the high 30s by dark. The mooring team is about to splash the anchor on the third mooring in gentle swells and bright sun. Remember I said that the Agulhas flows southwest in a fairly ordered stream, narrow and fast, but that no current flows constantly the same direction at the same speed? Well, yesterday Lisa found that a big clockwise swirl of water about 100 nautical miles in diameter had formed up on the inshore side of the current in the vicinity of the Natal Bight just north of Durban. (A bight is and indentation in a coastline too shallow to be called a bay). 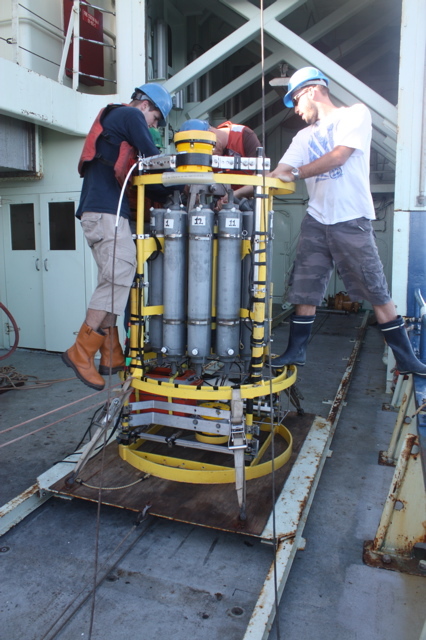 This— an eddy—is a well-known but by no means constant feature of the Agulhas Current. So yesterday, as they finished setting the second mooring, we temporarily found ourselves innortheast-setting current. The Agulhas Current overshoots the continent. It suddenly finds itself in the open ocean, and as if startled by that, the current does something remarkable, something highly unusual among its relatives worldwide. It makes a sharp turn, almost a u-turn, and heads back eastward across the Indian Ocean toward Australia. In technical lingo, this is called the Agulhas retroflection. 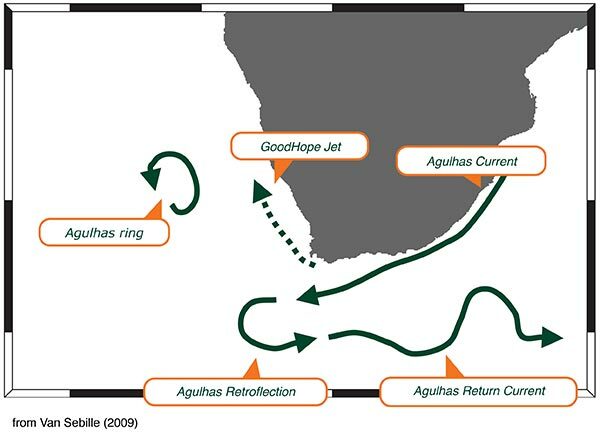 And the new eastward flow is known as the Agulhas Return Current. But that’s not the end of the unusual behavior of the Agulhas in this region south of Africa. Remember we stressed in an earlier essay that all currents of the world are connected, communicating with adjoining currents such to link all oceans into one World Ocean? That being the case, Indian Ocean water must find its way into the South Atlantic. Not all of the Agulhas Current water goes back eastward in the Return Current. It’s as if the turn were so sharp that some water, like the kid at the end of the crack-the-whip game, is propelled on westward by the force of momentum. That’s not of course a scientific way to say it, but it’s not entirely wrong. Great eddies of Agulhas water are left behind to spin into the neighboring ocean, the South Atlantic. Some but not all of them get entrained in the cool Benguela Current flowing northward up the east African coast. Other Agulhas water reaches the South Atlantic in less dramatic ways. Thin fingers, or filaments, of it “leak” into the South Atlantic. But the main point here, if we look at it in terms of the one World Ocean, is that the only way Indian Ocean water finds its way into the adjoining ocean is by agency of the Agulhas Current. That’s one among many reasons why the Agulhas is significant. All right, wait one minute, you might ask, how do we know all this? You look out on the ocean from the beach or even from aboard a ship out of sight of land, and all you see is water. My shipmates and I, even Dr. Lisa, an expert, can walk out on deck and look outboard. All we’d see is water. Now, the Agulhas is a deep, a beautiful blue color, but if you didn’t know what ocean you were in, you might mistake for the Gulf Stream. (In fact, that blue is characteristic of water on the west side of most all oceans, but that’s getting a little ahead of the story.) So let’s phrase the question this way: How do scientists distinguish one mass of water from another? How can Dr. Lisa and her colleagues tell Agulhas Current from the rest of the water in the Indian Ocean? Salinity: All ocean water is salty. But not all ocean water is equally salty. For instance, water originating in the tropics—like the Agulhas, like the Gulf Stream—tends to be saltier than cold water from the high northern and southern latitudes due to heavy evaporation under the hot tropical sun which “takes” water away and leaves salt behind. There’s only a tiny difference in the amount of salt in a bucket of water from the Arctic and one from the Agulhas, but the difference can be measured. I’m sharing a lab space with Robert, from Scripps Institution of Oceanography, who’s doing that very thing with water samples taken by an instrument called the CTD (more about that later. But what makes these measurements useful is that as water masses move in currents around the world, they maintain their salinity fingerprint. They can thus be identified. Temperature: Some ocean water is warm, some cool. That’s pretty obvious. However, like their salinity, water masses maintain their distinctive temperatures as they move around the globe—not absolutely; a certain amount of mixing happens en route. But still the point remains. If you can measure within fine tolerances the temperature and salinity of a water mass, you can distinguish its identity. You can say, yes, I found this water in the South Atlantic, but I can tell for sure that it came from the Agulhas Current in the Indian Ocean. Here’s an amazing example of water-mass identity and travel: Flowing beneath the Agulhas in the opposite direction is water from the deep North Atlantic that originated near Greenland. And on the edges of the continental shelf off Greenland, scientists have found water that originated in the Gulf Stream a half a world away. 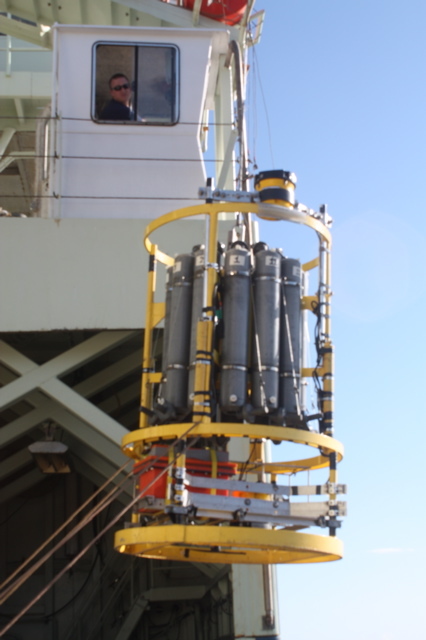 We’ll talk more another time about the CTD and the other ways and means of indentifying water migration. A few of us gathered on the main deck after dinner to watch the sunset, and as sometimes happens, we started telling sea stories about research ships and heavy weather we’ve known. “We were off the Antarctic Peninsula, and it was blowing seventy—” “One time in the Labrador Sea in November, we—” I could go, but you’d sort of have to be here.